Zdenek Dolezal is an artist from Prague and for the first time he exhibits his works in Switzerland. The former dancer and Professor for ballet dancing at the Prague conservatory today shows scenes from stage life in the technique of bobbin lace. 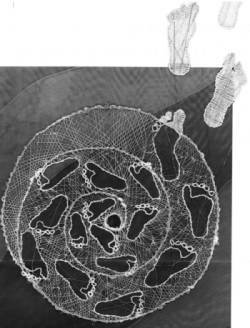 Maria Lehner-Mueller, Beatenberg, shows pictures in bobbin lace. With the use of coloured materials her work gets an new effect.